Today we are going to show you how to avoid and eliminate one of the most common reef tank pests: Cyanobacteria, more commonly referred to as Red Slime Algae. Red Slime is one of the most common problems aquarium hobbyists come across. We get hundreds of calls and questions each month from customers asking how to get rid of it and why it is growing in their tank. Red Slime Algae is actually a bacteria. Cyanobacteria, to be specific. 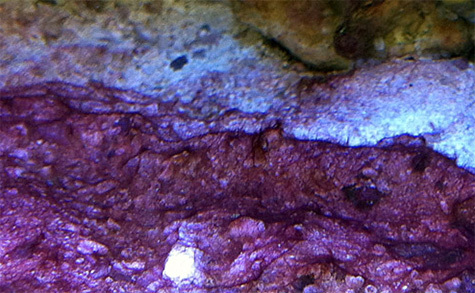 Elevated waste levels including both phosphate and nitrate are the leading reason this slimy red film grows in your tank. Lack of proper water circulation and old light bulbs also cause excessive growth of Cyanobacteria. First, test your phosphate level—which should be maintained at 0.05 ppm or below. We have a great article and video that talks all about phosphate control if you want to check them out. One thing to keep in mind is that phosphate can become “locked” in Red Slime, so it is not abnormal to experience excessive Red Slime growth yet still have your phosphate level test within acceptable ranges. The best method of prevention is to simply keep your phosphate level under control at all times. 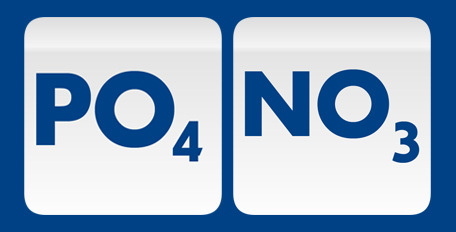 Your nitrate level should also be kept under control and should test below 10 ppm. Frequent small water changes, proper filter maintenance and responsible feeding techniques will help you lower keep your nitrate level within acceptable ranges. If you notice that Cyanobacteria is only growing in certain areas of your aquarium, it is likely that a lack of water circulation is causing your problem. Detritus tends to build up in these low flow areas (or “dead spots”) and since the water is not well-aerated it allows Cyanobacteria to proliferate. The solution here is to eliminate the dead spots by redirecting or adding powerheads or rearranging rocks in your aquascape to allow better water circulation. Another cause of Red Slime and many other types of algae are old light bulbs. The spectrum of light emitted by a bulb will shift as it ages. Even though a light bulb will still illuminate for months after its recommended life span, the spectrum change can cause undesirable bacteria and algae to grow inside your aquarium. 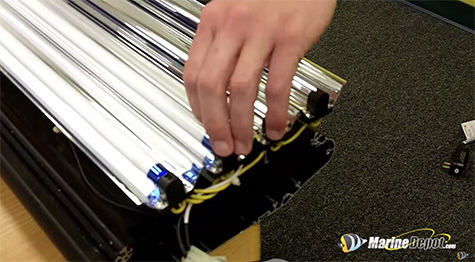 Replacing your T5 bulbs and/or metal halide light bulbs regularly will help you avoid this issue. If Red Slime has become out of control in your aquarium, you need to remove it. This is best done one of two ways: physical removal via siphon and water change or using one of the many chemical treatments that kill Cyanobactera. 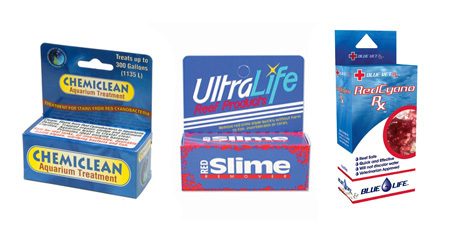 Boyd Chemiclean, Ultralife Red Slime Remover and Blue Life Red Cyano Rx are all excellent, reef safe solutions. Just be sure to follow the instructions carefully and take care of the previously discussed underlying causes that created the Red Slime problem in the first place. Once your tank is clean and free of Red Slime, be sure to keep up with a regular water change schedule, keep your phosphate and nitrate under control, change out your light bulbs on time and ensure you have good water circulation throughout your tank. If all of these factors are kept in line, Red Slime will no longer plague your tank. If you need help choosing the right products to rid your tank of Red Slime, our trained team of aquarium experts is happy to help you out. If you found this information helpful, please like and share this blog or accompanying video to help other hobbyists avoid this aquarium scourge. Don’t forget to subscribe to our YouTube channel to stay up-to-date on all the latest aquarium gear and receive honest advice from real hobbyists. Thanks again for tuning in and until next time, take care and happy reef keeping. 4See all the red slime removers available at Marine Depot. 4See all the phosphate removers available at Marine Depot. 4Watch and learn how to control phosphate in a reef tank. 4Read another in-depth article from Marine Depot on Cyanobacteria.